The only mistake I made with this recipe is not making a double batch. These bars didn’t last at ALL. 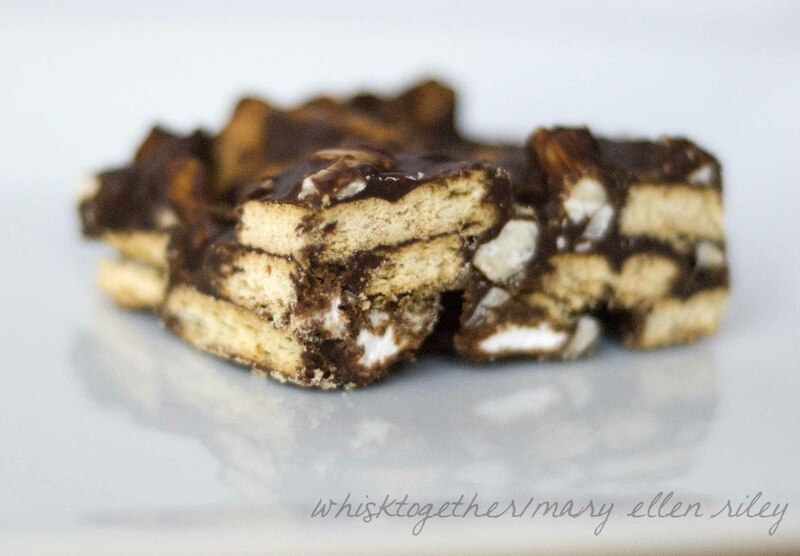 I’ve made s’mores snacks before – usually with Golden Grahams cereal, marshmallows and chocolate chips with a little corn syrup. But these are WAY better! The toasted almonds add a lot to this recipe. You could always substitute another nut like peanuts. 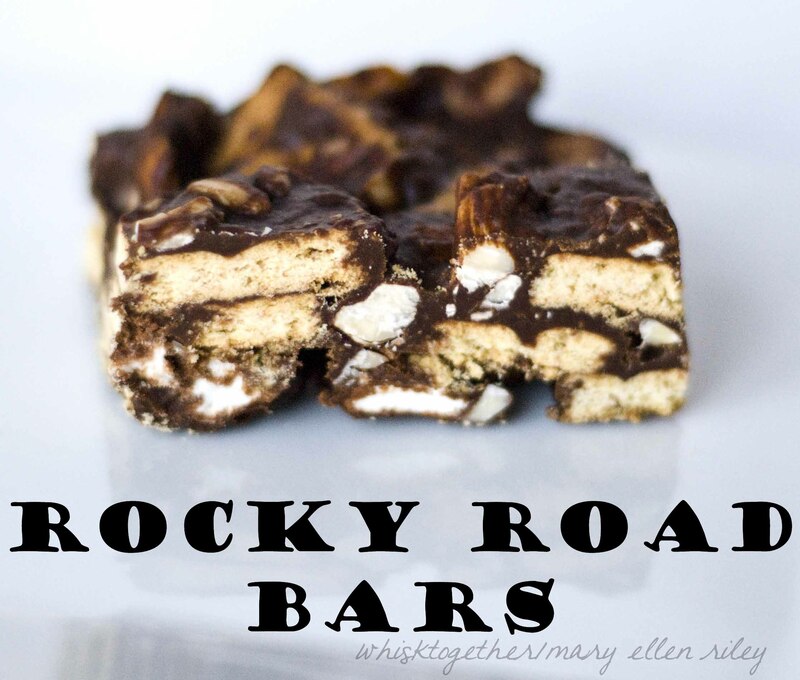 When I think of rocky road, I think of the Edy’s Rocky Road ice cream I grew up with as a kid which included almonds. -To toast the almonds, I have read that you can use the microwave. It is hard to watch the nuts though doing this, so I just throw them into a pan on medium-low on the stove top. I wiggle them around a bit for about 8-10 minutes or until you can start to smell them. It’s easy to go overboard in the microwave. I also tried to microwave the butter and chocolate mixture. This worked okay until I added the marshmallows and it never seemed to come together properly. Melting on the stove top seemed to work best. -I only have a 9×9 pan and that is what I used for the photo above. If you have an 8×8 pan – use that instead. 1. Take a piece of foil a little larger than your 8×8 or 9×9 pan and grease it with shortening or butter. I used non-stick foil here, so I didn’t have to grease anything. I’m lazy like that. 2. In a large bowl, mix up 1 cup marshmallows, the graham crackers, and the almonds. 3. On low heat, melt the butter in a medium sized skillet or saucepan. Dump in your marshmallows and melt those in with the butter. Keep stirring until they are all melted in. Now add your chocolate and corn syrup and stir that in until melted – should take less than a minute. 4. Pour that melted chocolate mixture over the graham cracker/nut mix and fold it in quickly and gently. When the chocolate has been incorporated, dump it all into the 8×8 pan and press down. Put it in the fridge for a couple hours. Cut and serve. Because the people I’ve met through this blog are so awesome and because I love doing the blog – I decided to do a giveaway. This is from me – not Amazon, or America’s Test Kitchen (oh I wish!) or some big name sponsor like Pepsi. So you can enter up to THREE times. The winner will receive my favorite cookbook ever (so far): Cook’s Illustrated by America’s Test Kitchen. It pretty much has every good recipe of everything. Like most people, I don’t like going through 10 different recipes for chicken fajitas, or gingerbread cookies, etc. Though I did go through 10 different oatmeal raisin cookie recipes and I am okay with that. So is the hubby. Giveaway will end Saturday, August 11th at midnight. My favorite recipe is one that I have made a number of times. It is a lemon square recipe that I found in the Montessori cookbook to the Montessori school I went to long ago. It is a favorite of the family and others. They are always requesting I make it. So glad you posted this recipe. They were delicious! Favorite recipe ever is very hard to pick! But I guess I will go with my grandma’s sugar cookie recipe ( the kind you cut out and decorate), which is the best sugar cookie recipe in the world! and is the only one I have ever used (and the only one my mom ever used). I think my favorite recipe is Grandma Paula’s (Paula Deen) Red Velvet Cake. Not a fan of Paula Deen, but this recipe comes out amazing every time and has become a holiday tradition. My grandmas brownies. Just the smell alone makes me feel like she’s in my kitchen. My favorite recipe ever is my grandmother’s fudge pie – completely decadent! I like Whisk Together on Facebook! Wow! I hope family is not excluded from this giveaway!! LOL If so, oh well, I’ll comment anyway. I already “like” Whisk Together on facebook and subscribe to the blog. My favorite recipe of all time?? That’s a toughie! Gonna go with Chocolate Zucchini Cake from the Capper’s Weekly (from many years ago). I really enjoy seeing all the yummies you post! My favorite recipe is Chicken Scallopini, a copycat recipe from Macaroni Grill. Hmmm…..favorite recipe? Wow…I guess I would have to say my Mom’s lasagna!